In order to better protect your product, or create a stronger appeal for it, be it valuables or works of art, Solits has developed this acrylic display case. What do we do differently? 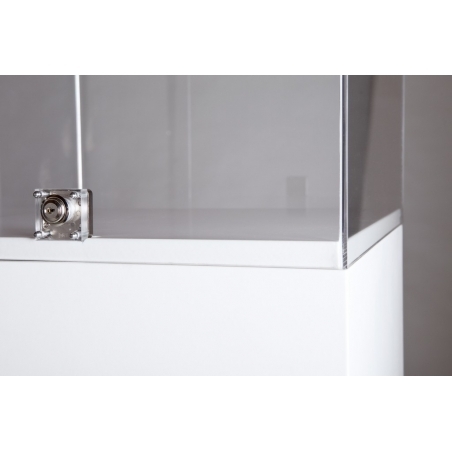 We attach a made-to-measure (its size is very precise, down to a mm) mounting plate on top of the plinth and place the acrylic hood over it, creating a nearly invisible and smoothly integrated connection between the two. In case you were looking for something to protect your display with against dust or impact, this 4 mm thick plexiglass case is a perfect choice. 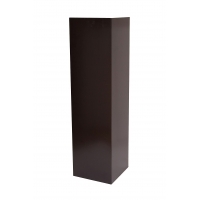 If you order both a plinth and a display case with us, we will also offer you a complimentary top plate of the same color as the plinth. 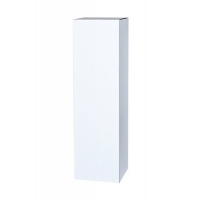 It ensures that your acrylic hood fits seamlessly and is properly secured. Would you like to have a lock attaching it to the plinth, to make sure your display case does not get tampered with if left unattanded? 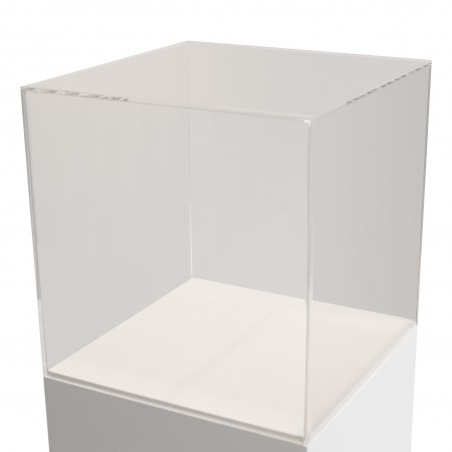 Are you looking to order bespoke display cases specifically made for your exhibition/retail/office space? 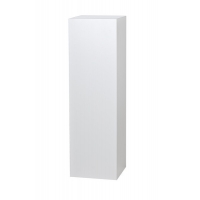 Please, contact us regarding all possible combinations at info@plinths.co.uk . Please, note that the inner size of the acrylic hood is smaller than the outer size because of the top plate. Therefore, the inner height can be calculated as follows: the outer height minus the thickness of the top plate, and then also minus the thickness of the acrylic hood itself. Looking for an inspiration to create your ideal display? Read how this customer used our products, including the perspex display boxes.